I just took some pictures of a new lamp that we have been working on. The final form has yet to be determined, but the lighting effect has. I'm thinking that they will be pendants, but in the meantime we put them on a lamp base to see what would happen. 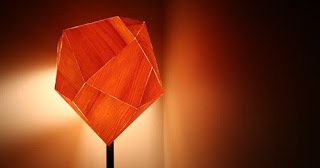 With the light on, the solid structure almost looks fractured at the joints, and the veneer takes on a nice glow. If anyone is thinking of making one at home, the secret is corn starch. Limited production run to follow.